Experts is the restoration of antique fireplaces. We have over 300 fully restored antique fireplaces available in our showroom or online at www.oldfireplaces.co.uk Probably the largest collection of fully restored Original Antique Fireplaces under one roof in the UK our antique fireplaces collection consists of Victorian fireplaces, arched inserts, tiled fireplace inserts, Edwardian fireplaces, hob grates, marble fireplaces, bedroom fireplaces, slate fireplaces, stone fireplaces, wood fireplaces, cast iron fireplaces, Art Nouveau fireplaces and chimney pieces. 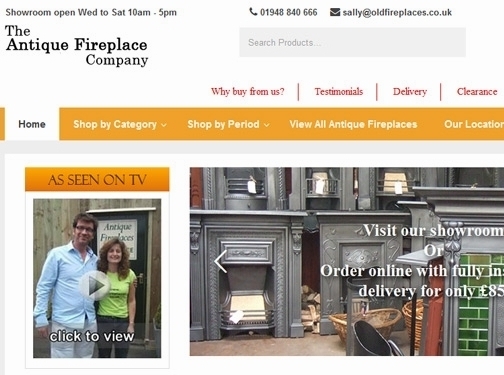 UK (Whitchurch, Shropshire) based business providing antique fireplaces and fireplace accessories for sale. Website includes e-commerce facilities, delivery and returns information, testimonials, press mentions, terms and conditions, details of business premises (with photos), full contact details.